Formed for the purpose of playing 2008's Instal Fest, this trio comprises C Spencer Yeh (of Burning Star Core), Ben Hall (of Graveyards) and Don Dietrich (of Borbetomagus), coming together for the common cause of relentless, ear-blasting improv. Sax-toting noise legend Dietrich is no stranger to the more abrasive school of free improv, having been operating in the field since the early 1980s, but the comparatively fresh-faced Yeh and Hall hold their own here (manning violin and traps, respectively). This music sounds like only a very distant cousin of free jazz, instead positioning itself as an explosive noise record performed via organic means - perhaps as you'd imagine Merzbow Unplugged to sound, perhaps. 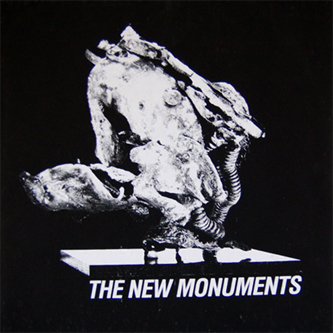 Fierce and punishingly primal, The New Monuments are a considerable force, hitting you with the full impact of undiluted, raw expression.